This article appeared in the Observer on Sunday May 11 2008 on p28 of the Focus section. It was last updated at 01:32 on May 11 2008. It is early morning in Barcelona's La Boqueria market and the fish stallholders are setting out their wares. Mounds of pink and grey glisten down the dim alleys - shoppers and tourists peering at the fins and tentacles. It is not like any fish shop in Britain - some stalls sell five different species of squid and cuttlefish, half a dozen types of shrimp and prawn, 10 different cuts of salt cod. It is a fish eater's haven in the heart of a city that eats and sells more fish than anywhere else in Europe. Anyone who cares about where their fish come from - and this should mean anyone who wants to go on eating them - should take two tools when they visit the fishmonger. One is the handy guidance provided by the Marine Conservation Society, Fish to Avoid and Fish to Eat (the latter is still the longer); the other is a ruler. My ruler is the type handed out to commercial fishermen by the international advisory body, Incofish, and has pictures of key species with marks indicating when they can be considered mature (and, thus, OK to catch). So I set about lining up my ruler against the La Boqueria fish, starting with the mackerel (should be 34cm), the plaice (39cm) and the redfish (45cm). All turn out to be mere babies. The mackerel is half the designated length. A glance around the stalls shows 10 or more species on the MCS's Avoid list, including hake, swordfish, monkfish, bluefin tuna and, of course, cod. I don't spend much time doing this because the Catalan fishmongers don't like my ruler - or me. They don't want to talk about why they are selling tiny hake (one of Europe's most endangered species) and why not a single fish in the market has any 'sustainable' labelling. Many of those fish you can see in such glorious abundance in Spanish markets - and on our own supermarket shelves - come not from European seas but from the coasts of the continents of the poor: Africa, South America and parts of Asia. Fishermen have always roamed far afield - the Basques began fishing the great cod populations off Newfoundland at least 500 years ago. And when serious shortages in traditional stocks around Europe began to be commercially apparent 30 years ago, the trawler fleets began to move south. Strangely one of the first international attempts to conserve fish stocks, especially for the more easily exploited nations, also became part of the disaster. The United Nations Convention on Law of the Sea, signed in 1979, extended national rights over fisheries to 200 miles from a country's coasts. But it included a provision that, if fish stocks in that zone were surplus to national needs, the country could sell its rights to outsiders. That convention allowed cash-strapped and sometimes corrupt countries in west Africa to raise funds by letting the industrial trawler fleets in. Since 1979 the EU has negotiated deals on fishing rights with a string of impoverished African countries. Despite the EU's own studies indicating massive and quite possibly irreversible damage to fish stocks off west Africa, these deals continue to be struck. In 2002, the year an EU report revealed that the Senegalese fish biomass had declined 75 per cent in 15 years, Brussels bought rights for four years' fishing of tuna and bottom-dwelling fish on the Senegal coasts, for just $4m a year. In 2006, access for 43 giant EU factory fishing vessels to Mauritania's long coastline was bought for £24.3m a year. It's estimated that these deals have put 400,000 west African fishermen out of work; some of them now take to the sea only as ferrymen for desperate would-be migrants to the Canary Islands and Europe. And among the millions of Africans who depend on fish as their main source of protein, consumption has declined from 9kg per year to 7kg. North Atlantic fish stocks have been in decline for well over a century. Callum Roberts points out in his recent book The Unnatural History of the Sea that it was obvious from the 1880s that fish stocks were in decline. Fish catch records from the 1920s onwards show that, despite the enormous improvements in boat design and trawling technology and better refrigeration, catches of the great Atlantic species, such as haddock, cod, hake and turbot, remained constant or slowly declined. As they have ever since. Unlike global warming, the science of fish stock collapse is old and its practitioners have been pretty much in agreement since the 1950s. Yet Roberts can think of only one international agreement that has actually worked and preserved stocks of an exploited marine animal - a deal in the Arctic in 1911 to regulate the hunting of fur seals on the Pribilof Islands. So why has the international community failed so badly in its attempts to stop the long-heralded disaster with our fish? 'Quite simply,' Roberts says, 'agreements and deals brokered by politicians will never be satisfactory. They always look for the short-term fix.' He and his team at York University did a survey of the last 20 years of EU ministerial decisions on fish catches and found that, on average, they set quotas for fishing fleets 15 to 30 per cent higher than those recommended as safe by scientists. 'What that figure doesn't tell you is that often, for less threatened species like mackerel or whiting, they have set quotas 100 per cent higher than the science recommended. So, in their efforts to pacify the industry, they are bringing populations that could be sustainably fished into the risk zone,' he said. The fishing industry, Roberts feels, has exerted excessive influence on politicians in Europe's Atlantic nations since the 18th century - when it was necessary to keep the fleets well manned, as a source of seamen for their navies when war broke out. According to Greenpeace, Chinese fishing fleets are among the most rapacious when it comes to hoovering up the stocks of small nations in the Pacific and Atlantic. But in no Asian country is the notion of sustainable fishing much developed among consumers - and it is from consumers that any demand for change must come. Because, as Roberts and all the green lobby groups note, the structures and organisations set up by politicians and industry to control fisheries, or even preserve the most endangered species, have entirely failed. The Observer went to see one of these bodies in action in Tokyo a few weeks ago. ICCAT, the International Commission for the Conservation of Atlantic Tunas, is an obscure - if you're not in the tuna business - Madrid-based organisation that spends some €2.3m (£1.8m) of EU taxpayers' money a year collating and commissioning scientific research, and holding meetings for the 45 nations with an interest in the tuna-type species in the Atlantic and Mediterranean. These include the US, Japan, China and the UK. If you work for ICCAT, it's a high air miles life: Tokyo in March, Florianopolis, Brazil, next month. This is all in the cause of conserving tuna, of course. Which ICCAT, all observers agree, has utterly failed to do. After the first day's talks the Japanese government threw an ICCAT party. Delegates - fishermen, industry moguls, scientists, lobbyists and fisheries ministry reps - stood around chatting politely, sipping their drinks, in a grand carpeted conference room. Some very senior EU fisheries people were there, but not Mitsubishi, the enormous Japanese company that buys most European tuna. It pulled out at the last moment. Silver plates in hand, the delegates tackled the buffet. Among the crabmeat pilaf and stewed chicken, there were several platters of sushi. There were nigiri rolls with slivers of raw-red belly meat on top - probably bluefin tuna, the most endangered commercially exploited fish in the world and most likely brought to Japan by Mitsubishi. Bluefin is also the world's most expensive fish - a tuna that was sold in Tokyo's Tsukiji market this year went to a Hong Kong-based trader for the price of a top-of-the-range Mercedes. ICCAT may be the most ineffective international organisation of all time. In the course of its 42-year life, several tuna species in the Mediterranean and Atlantic have come near disappearing, and nearly all are in grave danger. 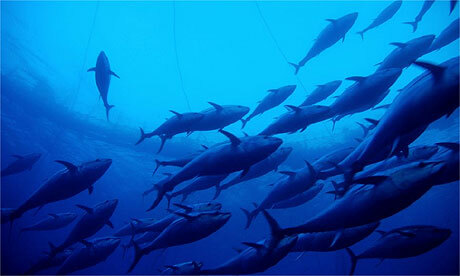 Despite the endless conferences and scientific studies sponsored by ICCAT and member nations, WWF's analysis shows that catches of bluefin tuna, a 'critically endangered species', according to the standards of the respected World Conservation Union, are 'dramatically higher' than the quotas set. And that catches are consistently under-reported, or not reported at all. While EU ministers promise action on illegal fishing of tuna, they also continue to underwrite the tuna fishing industry through massive subsidies: €16m (£13.1m) has been spent in recent years on the European purse seining fleet alone, according to the international lobbying group Oceana. The problem for many observers is not just that ICCAT is ineffectual, but that it may be doing more harm than good. 'If you announce, as ICCAT did two years ago, an "emergency fisheries recovery" plan, then you are telling the concerned public that something is being done about the problem. But it isn't - the fisheries recovery plan is a misnomer,' says Roberts. ICCAT refused requests for an interview, telling us to go and look at its website instead. Is there any hope for fish? If we cannot sort out the problem of bluefin tuna - a highly prized fish, whose life cycle is well understood, and whose fishing is closely monitored - what hope is there for the other stocks? Will our children eat wild fish or only farmed? Tudela sees some encouraging movement in Europe - the French, major tuna fishers, have for the first time prosecuted some quota-busting fishermen. At European Commission level, he thinks the problems are being taken a little more seriously.